The last time the world took notice of higher education in Myanmar, it was in the aftermath of the brutally repressed student uprising of August 1988, which resulted in thousands of deaths and arrests and stronger sanctions from the international community. The political transition that started in 2011 has triggered the resumption of international collaboration in the higher education sector and the launch of a comprehensive education sector review led by the government of Myanmar with strong support from development partners. The purpose of this analytical exercise is to pave the way for increased external assistance based on an objective diagnosis of the current situation and needs, to help the government and other stakeholders formulate a strategy for the future development of higher education. The first higher education policy dialogue workshop in Myanmar since the beginning of the political transition took place in Naypyitaw on 29 June 2013, with a focus on “Empowering Higher Education: A vision for Myanmar’s universities”. It was convened by the British Council with strong participation and support from AusAID, the Asian Development Bank and UNESCO. I was invited as an advisor to AusAID. 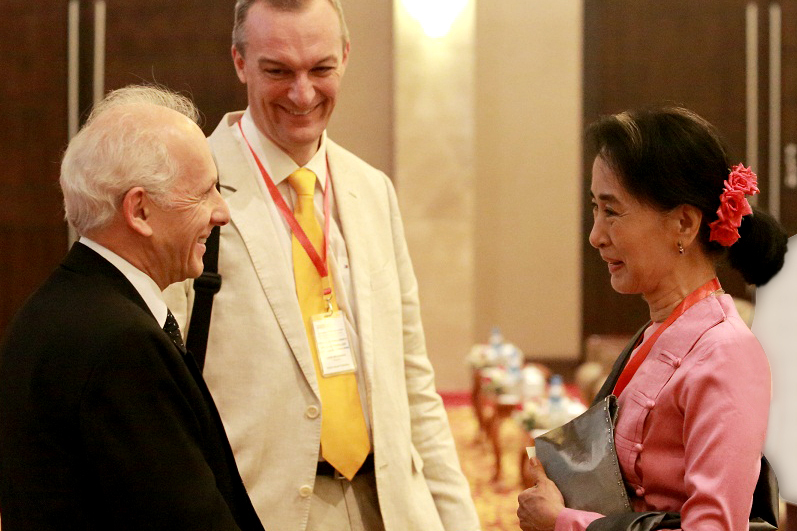 The two-day meeting brought together representatives of the various ministries overseeing the operation of higher education institutions, rectors and academics, student leaders, and members of parliament, including the Nobel peace prize laureate Aung San Suu Kyi. The workshop offered a unique platform for policy dialogue around the main issues facing higher education in Myanmar, allowing many stakeholders who had not had a voice for several decades – especially students from all over the country – to participate actively in the deliberations. The official opening statement by Deputy Union Minister of Education Myo Myint outlined changes the government had already made to improve education as well as plans to revitalise higher education and intensify international partnerships. It was of great significance and symbolic value that this was followed by a speech delivered by Aung San Suu Kyi in her role as chair of the parliamentary committee for revitalisation of Yangon University. In her inspirational speech about the role of education in constructing a democratic Myanmar, the Nobel laureate spoke about the priorities for restoring universities, articulating four dimensions of empowerment as the organising principles that should guide higher education development in the current reconstruction phase. The first one is empowerment through autonomy, which would allow universities to manage their academic activities in an effective manner, as opposed to the present situation of strict government control. The second is inclusiveness, a basic requirement to ensure equal opportunities for all groups in Myanmar society in terms of access and success in higher education. This emphasis on equity is all the more important as large segments of the population have been excluded from higher education since the 1988 crackdown. The third principle is empowerment for change, referring to the ability of each university to transform itself into an innovative institution. 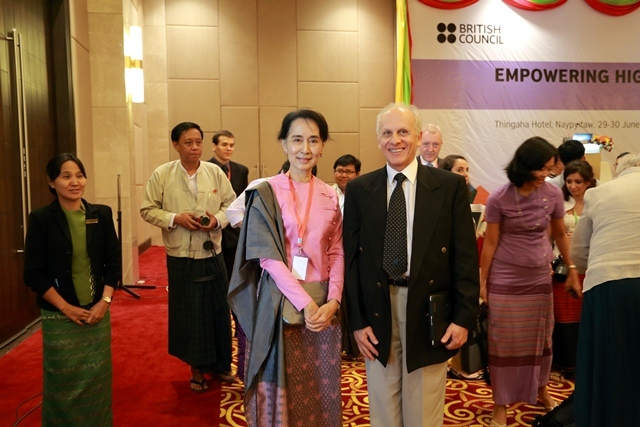 And the last one is empowerment for the future, through reforms of the curriculum and pedagogical practices with the purpose of better preparing the young women and men of Myanmar who will be responsible for creating a more democratic society and building a more productive economy. After the presentation of the preliminary results of the sector review – indicating major performance gaps in terms of coverage and equity, quality and relevance, financing and governance – I urged the workshop participants to consider five key points as Myanmar moves forward to reconstruct its higher education system with possible support from several donor agencies: opportunities, challenges, vision, consensus-building and coordination. First of all, the political transition represents a unique opportunity to ‘get it right’ – to construct a sound and balanced higher education system for the long term. Many, if not most, countries in the world are hampered in their efforts to improve higher education by the weight of tradition and the reluctance of stakeholders to embrace change. The current situation offers a unique opportunity to undertake courageous reforms that are often not possible in other countries because of vested interests and entrenched positions that block meaningful change. Second, the national authorities and university leaders face a perplexing dilemma as they work on reconstructing the higher education system. On the one hand, they are faced with a myriad of immediate tasks to get the system to operate properly again. On the other hand, they should devote, as a matter of priority, sufficient time to thinking seriously about the future of higher education in preparation for the long-term transformation that is needed. Balancing the resolution of urgent problems and the careful preparation of future developments is a major challenge that must be addressed effectively. Third, preparing for the future requires elaborating a vision and formulating a strategic plan to guide the harmonious development of Myanmar’s higher education system. This would involve setting clear targets in terms of quantitative expansion and the reduction of social and ethnic disparities and defining the desirable institutional configuration of the system; that is, the types of institutions – universities and non-university institutions – that are needed to satisfy demand for higher education, as well as the specific mission of each category of institution. The plan would include identifying the conditions necessary for the proper functioning of all institutions from the viewpoint of supporting quality assurance mechanisms, appropriate governance and sustainable funding. Fourth, the development of a vision and strategic plan should not be a technocratic exercise rigidly controlled from the top. 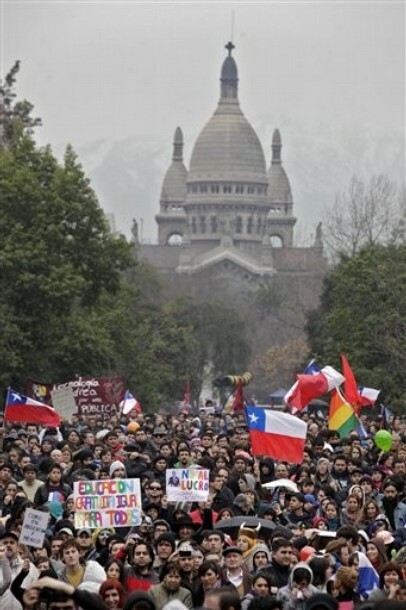 It will only become meaningful if prepared in a participatory mode as a consensus-building process, bringing together the diverse constituents of the higher education community and allowing for a high degree of tolerance for controversies and disagreements around the content of the needed reforms and the proposed changes. Achieving consensus on higher education policies requires a transparency of approach and creating confidence among all stakeholders. Last but not least is the need for effective donor coordination. Countries in transition like Myanmar, emerging from a long period of international isolation, often become the donors’ latest darling. Offers for university partnerships abound all of a sudden; many projects are being prepared concurrently. But these concrete manifestations of good intentions are not always coordinated, and carry the risk of pulling the higher education system in several directions. The onus is on the government and parliament of Myanmar to make sure that donor support is consistently and coherently anchored in the country’s vision, plan and priorities. As Myanmar moves forward to reconstruct its higher education system, all stakeholders should bear in mind the notion expressed by the president of the University of Maryland, at the beginning of the financial crisis in the United States, that “a crisis is an opportunity not to be wasted”. I would paraphrase his observation by stating that, in the case of Myanmar, the political transition is too good an opportunity to be missed, as the country commits itself to establishing the basis for a strong higher education system. Les grands ne nous paraissent grands que parce que nous sommes à genoux. Levons-nous!